Seemingly I had no idea how to join in new yarn so there are holes in my work that now need ‘covering up’ whilst sewing in the ends. It is a slightly strange shape, too rectangular for my liking. Although I guess this is quite fixable as all I would have to do is rip out the few border rows that I have done and add in a stripe or two. I also have messed up on picking up stitches on the short edges for the border….way too tight. All in all not a classic piece of crochet! It breaks my heart to make the decision but I am going to rip it out. I showed it to my husband the other day and he agrees that it’s the right thing to do. We have plenty (or is that too many?) 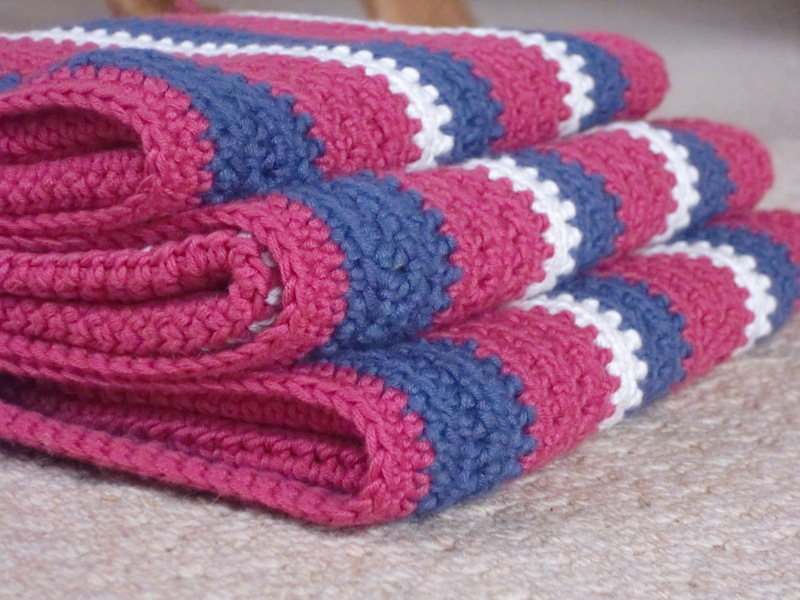 blankets and I am sure that the yarn can be used for something else…..oooh the possibilities!! My husband kindly called it a learning experience! Of course have no records of how much yarn I have used exactly but have kept some of the ball bands. I’ve also given the blanket a little weigh on the scales. So, as soon as I have finished my striped Roxborough Dolman sweater I shall be frogging away for a few nights! Ball winder anyone?